Development is about change. Change for the better. And all governments, irrespective of levels of development or political ideologies are interested in bringing about such change within their social and political systems. This may mean changing a health care system to benefit more poor and the elderly, or providing access to primary education for all. To do this, countries use all strategies and tools at their command to accelerate this process of change. Information and communication technologies (ICTs) are among the powerful tools that nations seek to deploy. Sometimes, the link between ICTs and development goals appears clear; at other times, it seems fuzzy. Yet, across the world, billions of dollars are spent every single year by the governmental organizations, non-governmental organizations (NGOs) and the private sector in ICT projects with the hope and intention of succeeding. Some succeed some fail. To know the reasons for their success or failure require an understanding of both ICTs and development. This primer seeks to provide an introduction to and preliminary understanding of the linkages between ICTs and the achievement of the human development goals in society. 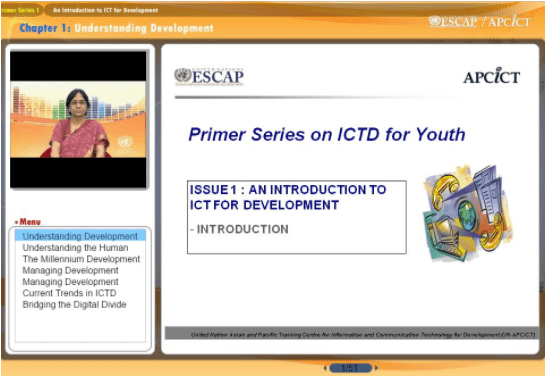 Today, this newly emerging academic discipline is called ICT for Development (ICTD or ICT4D). We will use the term ICTD during the discussion in this primer. This primer is designed to provide background information that students in undergraduate and graduate programmes can use as a starting point in the exploration of the various dimensions of the linkages through case studies of ICT applications in key sectors of development in Asia- Pacific countries. The aim is to foster a better multidisciplinary understanding of how ICTs can be used for social and economic development, and to equip students of different fields, from engineering to the social sciences with the understanding needed to use ICTs to meet a country’s development goals and needs. This primer can be used by all students, it does not focus on any aspect in detail; and it seeks to avoid the technical jargon that a specialized study of any aspect of ICTD may entail. Usha Rani Vyasulu Reddi is currently Professor of Education and Director of the Centre for Human Development at the Administrative Staff College of India in Hyderabad. From 1998 to 2006, she was Director of the Commonwealth Educational Media Centre for Asia based in New Delhi, India. Her work covered all of the Commonwealth countries of Asia and was focused on providing technical assistance and advice on the application of ICT in education, both formal and non-formal. Until 1998 she was Professor and Director of the Audio Visual Research Centre at Osmania University in Hyderabad. She has published widely in various academic, international and peer-reviewed publications.